Booking our r/t Los Angeles - Hawaii cruise was fairly spontaneous, through a deal we found through Expedia. 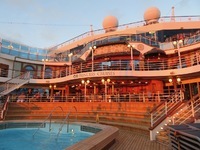 This was our ninth cruise, and we tend toward Celebrity. 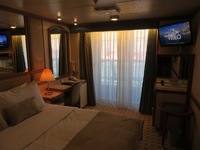 Our experience on the Emerald Princess was largely quite good. In reading everyone&apos;s reviews, it&apos;s interesting how different people&apos;s impressions can be. As far as we could tell, the ship is in very good condition. All the common areas seem especially well kept. I will discuss our cabin below. I can only compare our Princess experience to other lines we&apos;ve been on, especially Celebrity, so we were curious about the food. We were happy to have found the food served in the dining rooms to be very good to excellent. We didn&apos;t feel the need to pay for the upcharge dining as the included dining rooms were perfectly fine, with good variety. Buffet food was like typical buffet food. It largely wasn&apos;t bad, but not particularly memorable. I didn&apos;t care for the ship&apos;s layout, something you can&apos;t really do anything about. We missed having a walking track that circles the top deck. There is a little tiny one toward the back of the ship but 16 times around it equals one mile (boring). You also cannot circumnavigate the interior as you can on other ships; it&apos;s more of a linear layout. We&apos;re used to strolling around after dinner, up one side and back the other (especially on formal nights) and on this ship it&apos;s more fore-and-aft, repeated. Entertainment venues get waaay too crowded, quickly, especially when there is something going on in one of the lounges. And finding seats in the buffet area can be a frustrating challenge. 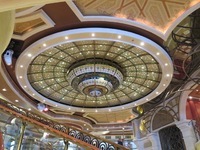 Ceiling detail in the "Piazza"
Booking our r/t Los Angeles - Hawaii cruise was fairly spontaneous, through a deal we found through Expedia. 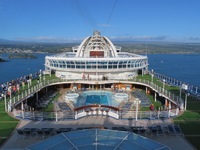 This was our ninth cruise, and we tend toward Celebrity. 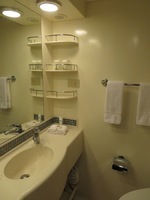 Our experience on the Emerald Princess was largely quite good. In reading everyone&apos;s reviews, it&apos;s interesting how different people&apos;s impressions can be. 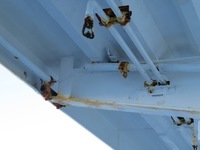 As far as we could tell, the ship is in very good condition. All the common areas seem especially well kept. I will discuss our cabin below. I can only compare our Princess experience to other lines we&apos;ve been on, especially Celebrity, so we were curious about the food. We were happy to have found the food served in the dining rooms to be very good to excellent. We didn&apos;t feel the need to pay for the upcharge dining as the included dining rooms were perfectly fine, with good variety. Buffet food was like typical buffet food. It largely wasn&apos;t bad, but not particularly memorable. I didn&apos;t care for the ship&apos;s layout, something you can&apos;t really do anything about. We missed having a walking track that circles the top deck. 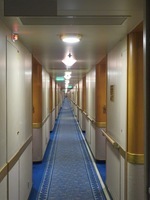 There is a little tiny one toward the back of the ship but 16 times around it equals one mile (boring). You also cannot circumnavigate the interior as you can on other ships; it&apos;s more of a linear layout. We&apos;re used to strolling around after dinner, up one side and back the other (especially on formal nights) and on this ship it&apos;s more fore-and-aft, repeated. Entertainment venues get waaay too crowded, quickly, especially when there is something going on in one of the lounges. And finding seats in the buffet area can be a frustrating challenge. 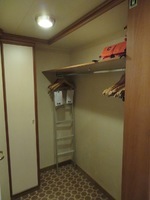 Our balcony cabin was very clean and in good repair. 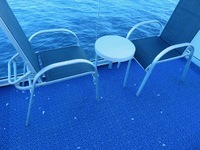 The carpet was showing wear, but consider how much traffic these cabins see. The only detail that struck me is that there is quite a bit of exterior rust showing. 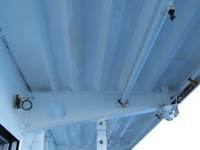 Each time the ship would be in port, the maintenance crew was immediately at work touching up white paint. However, all the touch-ups are showing and in places it looks rather patchy. This was most evident on many of the balconies. Overhead, bad rust was eating through the paint (despite evidence of past touch-ups). This certainly didn&apos;t bother us, only that every day our cabin steward had to pick up large flakes of old paint that would fall on the balcony floor and furniture. It also didn&apos;t make you want to eat outside on the balcony. I understand the Emerald Princess is soon to go into dry dock, so maybe she&apos;ll get a decent Earl Scheib paint job. Ensenada is included simply due to the Jones Act. We&apos;d never been, so we disembarked and walked around the tourist area. It was OK for once, but next time I mightn&apos;t get off the ship. We had our obligatory fish tacos and margaritas and returned to the ship. Walking through the old Riviera del Pacifico Casino is worthwhile, though, to admire its 1930s details. We didn&apos;t opt for a shore excursion on Hilo; we rented a car for the day and drove down to Hawaiian Volcanoes National Park. This is very easy to do. Unfortunately the day was extremely cold, gray, and windy. Luckily, the weather on our Honolulu day was picture-perfect. We took a shuttle to Waikiki just to walk around, look the beach over, and have delicious overpriced cocktails. It was a rather long walk, but we walked back to the ship from Waikiki. The way back was easy and very safe. We booked a shore excursion that went to Waimea Canyon and the Wailua River and Fern Grotto. We booked a shore excursion that went to Waimea Canyon and the Wailua River and Fern Grotto. Pity we were brought to only one canyon overlook, though. In Lahaina, we opted to just stroll around the port.